CHICAGO — Robyn Mineko Williams, fast becoming one of the most recognizable names in Chicago dance, premieres a new episode of UNDER(cover) this weekend at Links Hall. On the heels of last fall’s Mariko’s Magical Mix, a fantastical collaboration with Manual Cinema set on Hubbard Street 2, the original UNDER(cover) began as an independent work last summer at the Baryshnikov Arts Center in New York City, supported by a Princess Grace Foundation-USA Works In Progress Grant. 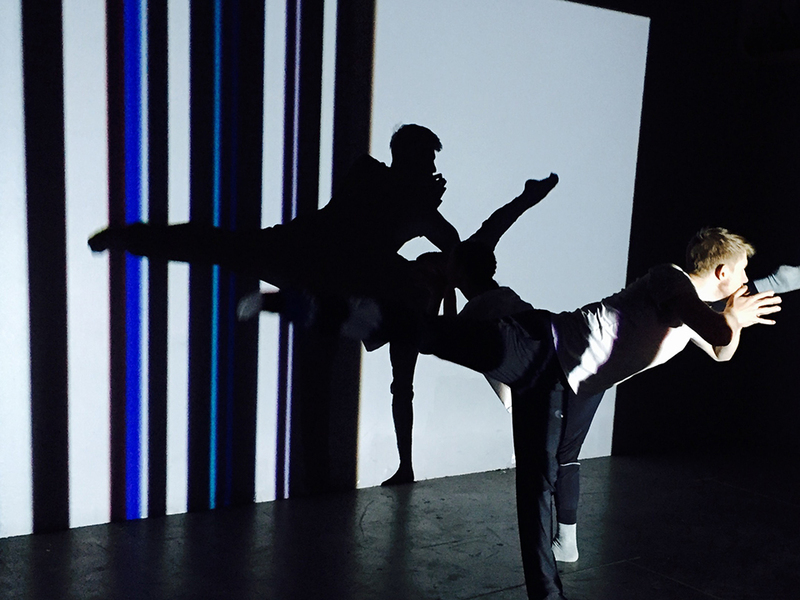 Play seems to be of multi-faceted importance as the creators and dancers of UNDER(cover) horse around with how their audience responds throughout the piece (creating a level of ambiguity for the dancers to deal with). Likewise, childlike play serves as the impetus for movement invention. Dancer Elliot Hammans is often secluded from his cast mates, as if in a “time out,” where he goes for a dancerly romp with his shadow projected onto a wall behind him. Video of toddlers bear hugging until they fall down is the source of a fantastic duet between Adrienne Lipson and Zachary Enquist, who first began working on UNDER(cover) with Mineko Williams in Montreal (Hammans was added later). Rare is the opportunity to see these dancers and this choreographer’s work from an arm’s length away, and her ability to work in intimate spaces might be Robyn Mineko Williams’ best kept secret. The little details of her choreography combined with the flawless technique of her performers is one of the many things that makes this performance really special. Even after novelty of a Hubbard Street crew hanging out at Links Hall wears off, the intimacy and accessibility of the space gives Mineko Williams an opportunity to play in a way we’ve not yet seen, with factions of Chicago’s dance audiences who may not be familiar with her work. UNDER(cover) Episode 002: Chicago runs May 26-29 7:30 p.m. at Links Hall, 3111 N. Belmont Ave. Tickets are $25, available at undercoverepisodes.com/tour. Friday and Saturday’s performances are sold out, with extremely limited seating on Thursday and Sunday.